Parsi food thankfully is accessible to all! Some of my earliest friends in Mumbai were Parsi. These were folks at work like Daisy and Veera who invited me home for meals when I missed home. Then there was Roshan who would make and get dhansak for office parties and pack some for me to take back to my PG. I then began dating a Parsi and got introduced to Parsi places such as the now shut Bay Bites at Nariman Point and Jimmy Boy where I first had the legendary laganu bhonu (wedding feast). We then got married. We had a registered marriage and a very secular lunch and dinner so there was neither Parsi nor Bengali food on our wedding day. In the initial years after our marriage my main taste of Parsi food was through the masala ni dar (daal) that my late grandmother in law would make for us every weekend when we visited her till she was confined to the bed with a fracture. Even then she would make sure that we ate well and once got a dozen eggs boiled for me. Eggs of course are the ultimate meal for Parsis. Festive occasions like the Parsi new year meant eating out with my in laws though it is no longer the same after my father in law passed away. Till then we used to go to clubs for a Parsi meal at times and sometimes to Chinese places which all Parsis love. 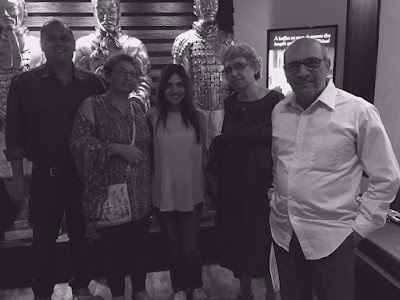 This time we went out on Pateti, the last day of the Parsi year to Mainland China for a Parsi meal that would make my father in law happy up there. His favourites were crab sweet corn soup (the national Parsi soup), golden fried prawns, any lamb dish and prawn fried rice. Ice cream at the end was a must for him. At least two servings. Over the years of being married to a Parsi, I have had many Parsi meals, made many Parsi friends, have eaten with them and, in the process, felt completely at home and welcome in Mumbai as my love for Parsi food grew. As today is the Parsi new year, I thought I will pay tribute to some of my favourite Parsi eateries in town. My Parsi family who made me feel at home in Mumbai. Yazdani is an Irani café. The dining out scene of Mumbai owes a lot to the Irani cafes and bakeries. The Iranis came into Mumbai in the mid 1800s. Looking for employment they decided to set us cafes and restaurants and bakeries, thus introducing Bombaiyites to the concept of restaurants. Locals hardly ate out before this. Iranis are technically not Parsis. They both are Zoroastrians and came to India from Iran. However, unlike the Parsis, the Iranis came to Mumbai more recently. Just about 200 years back. The sixty year old Yazdani Bakery in Fort is run by a Irani family. It represents a world before modern day coffee shops came into vogue. Along with places such as Kyanis and Merwan they are the last of the Mohicans when it comes to Irani cafes. Much to the angst of third generation owner of Yazdani, Tirandaz Irani, who says that his aspirations are held in check by his elders, there is no air-conditioning, toilets or wifi here. "I would like to go the new place myself" Tirandaz says referring to the nearby Starbucks! What you do get at Yazdani is the aroma of freshly baked bread, crusty brun maska (bun and butter) to dip into steaming cups of Irani chai which can be followed up with mawa cakes and khari biscuits and the raisin specked apple pie. And a surge of encouragement by seeing the will and spirit of Mr Zend Irani, Tirandaz’s uncle, who is at the counter every day despite his ailments. He steadfastly refuses to increase the prices of the products here. He is the driving force behind Yazdani, as Tirandaz wryly admits. Tirandaz too supports his father Mr Rashid Irani and uncle Zend, in running Yazdani. When the 'grown ups' are not around Tirandaz might even let you peek into the bakery and its majestic, deep, wide fired oven where the near Biblical bread is freshly baked from early morning. With rising real estate prices and the hard work involved, the future of gems like Yazdani Bakery is uncertain. You never know if they will last beyond the current generations. What you can do is go there and enjoy a slice of a fast disappearing city formerly known as Bombay while you still can. Jimmy Boy in Horniman Circle has more than a century of heritage behind it. It has replaced a hundred year old Irani café called Café India. Café India was primarily a bun maska and chai sort of place from what I gather. In the late 1990s, the current owners of Café India decided to convert it into a restaurant where one could enjoy a lagan nu bhonu (Parsi wedding feast) without going to a Parsi wedding. Café India was thus reborn as Jimmy Boy. K and I used to go there for the lagan nu bhonu while we were dating. The kind folks there suggested to us that we share a bhonu instead of ordering two separate ones. This made it a lot easier on the wallet. The new name is inspired by the nickname 'Jimmy', that the owner would give while placing trunk calls to Australia to Aussie telephone operators who could not pronounce his Parsi name. Jimmy Boy today is a full fledged Parsi restaurant and bakery. Its revival has been spearheaded by the young, hard working, Sherzad Irani, the owner’s nephew. It is a rare Parsi restaurant that is open for dinner. The lagan nu bhonu lies at the heart of the menu here. You get a vegetarian option too and one order is enough to serve two. The portions are fixed and they don’t mind if you share it. The menu consists of sarya (papad) and lagan nu achar, rotli (Parsi for roti) sali margi or chicken farcha (you choose), patrani machhi or saas ni machhi, mutton palao dar, laganu custard or koolfi. The vegetarian option has dishes such as laganu stew (more like a dry sabzi!) and veg pulao dar (dal). Dhansak, is a funeral dish, and not served on happy occasions. By Parsi restaurant standards Idea Corner in Fort is quite a ‘young’ restaurant. This new kid on the block was established just about thirty years back. Its owner, the ever smiling and soft spoken Perzen Patel used to run a motorcycle repair garage at the same premises. One day he decided that he would follow his other passion, the love for food, and open a restaurant. He sourced recipes from his aunts and Parsi chefs and then set up his restaurant. Ideal Corner is a small place, with a mezzanine floor and is packed during lunch time. It is shut at night and on Mondays. It is possibly my favourite Parsi restaurant in town and I used to often come here for lunch when I used to work out of the nearby Laxmi Building. They follow a daily menu here where the menu differs by the day of the week. Some dishes like the sali murgi, lacey cutlets and akoori (spicy scrambled eggs ) are available through the week. I love the dhansak here and K can’t get enough of the akoori, and I pack it and take it home for her. She likes the dar (dal) in the Dhansak as well. Some of the other nice dishes are the Railway Mutton and atheli margi. In fact I have never had a bad meal here. They serve a typically Bombaiyya Chinese too! I ordered it once. My advice would be to stick to the Parsi food. What I like about the food here is that there is a certain home-like feel to it. In fact I know of Parsis who approve of the food here. Believe me, it is tough to get a Parsi to like Parsi food served outside their homes. Plus there is so much variety in the way the same dish could be cooked across various Parsi homes and restaurants. Mohit Balachandran, known as Chowder Singh in blogging circles, manages Soda Bottle Opener Wala. Mohit says that he has a tough time delivering 'authentic' Parsi food. He says that he plans to put up placards at their restaurants saying 'Dikra na dikri, we know your mother's dhansak is the best, but give ours a chance too". From what I gather, Soda Bottle Opener Wala is opening in Mumbai's BKC in a month or so. The staff in Ideal Corner extremely friendly and welcomes you back with a smile if you are a regular. Pervez himself is usually at the counter. If you get to sit by one of the large windows you can see life pass you by in Fort, once the main CBD of Mumbai. Pervez has now decided to branch out as a consultant offering his services to those who plan to open Parsi restaurants. The other day we had ordered some Parsi food for K's Parsi roj nu birthday (Parsi calendar birthday). At the end of the meal my mother in law said 'food was nice but Kurush's is better'. Kurush Dalal is the son of the late Katy Dalal and runs Katy's Kitchen, a catering company, along with his wife Rhea, a Bengali. Unlike the owners of Yazdani, Jimmy Boy and Ideal Corner who are Iranis, Kurush is actually a Parsi. We got know Kurush and Rhea through blogging and then became friends. We often order in food from there when we have friends or family over. I love the food they send and as K once K said about my late father in law, he loved all of Kurush's food, especially the laganu custard. My favourites from their fare are mutton pulao dar, bheja cutlets, eeda and kolmi pattices, kolmi na sahs, sali margi. Pretty much everything actually. So here's wishing you a wonderful Parsi New Year and please celebrate it the way Parsis do by eating well.